(...) the formidable interpretative skills of conductor John Storgårds, who secures exemplary results from the Tampere Philharmonic. The sound is splendidly ample and detailed to match. (...) This enterprising release deserves every success. If you enjoy Kancheli, or Rautavaara, or what you might call the "new tonal school" of modern composers, then you're going to love this. It's also marvelously played and conducted (...), and the sonics are drop-dead gorgeous. An event not to be missed! 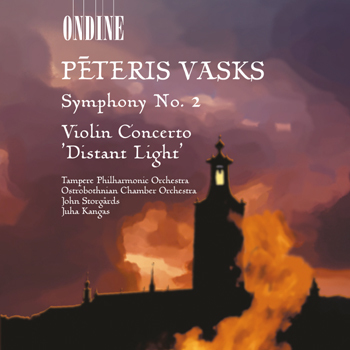 This award-winning CD contains music by the celebrated Latvian composer Pēteris Vasks. John Storgårds is featured as conductor of the Tampere Philharmonic in the Second Symphony, and as soloist in the Violin Concerto, where he is accompanied by the Ostrobothnian Chamber Orchestra under the direction of Juha Kangas.